When Anne reads what I’m about to say, she’ll be rolling her eyes, shaking her head and saying, “No, no, no, no, no.” Having reminded me yesterday of the severe shortages of even rationed foods, I have to confess that I used two – TWO – eggs today. One for lunch and one in tonight’s bread and butter pudding. In fairness, when I’m cooking meals for my husband, I don’t try to feed us off my rations alone, so you could argue that tonight’s egg was ‘his,’ or would have come out of our shared powdered egg ration. 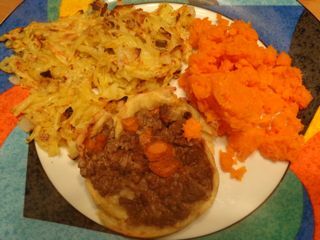 Mince tart, with onion/potato hash browns and mashed carrots. Only two days in and we’re both finding the main courses really filling. (Perhaps I should have served dinner on a simple white plate as the meal and plate combined is an explosion of colour.) Using leftover mince from last night, I made a mince and potato pastry tart, with onion and potato hash browns and leftover carrots. It tasted really good and, as I managed to make four tarts from the recipe, they’ll make a nice change from a sandwich for tomorrow’s lunch. 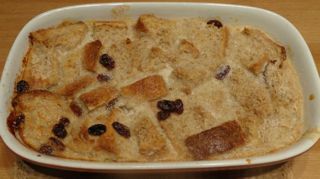 And here is the bread and butter pudding. To be honest, we’re both so full from the main course that we’re going to have to take a break and maybe come back to it this later in the evening. At the time of posting this, I can’t vouch for its taste… but it smells delicious. The good thing about tomorrow? I’ll be back to my full 1/2 pint of milk per day until Sunday. Making the bread and butter pudding drained the last of my milk ration for the day! As always, blackout times for Glasgow are at the very top of the front page: 7.07pm until 7am. Page One: With no edition on Sundays, the churches advertised their services for the following day. I decided to check out The Cathedral Church of St Mary on Great Western Road as – I believe – this is where my parents were married. On October 8th, the 18th Sunday after Trinity, Holy Communion (sung) would be held at 8,9 and 12.15, with Matins at 11 and Evensong at 6pm. The minister was Rev A.I. Haggart B.A. and (very interesting) all seats free. Page Two: The Battle of the Rhine is again increasing in violence, and according to the German commentator, Sertorius, the British have now succeeded in establishing a bridgehead across the Lek, which is being secured by further reinforcement. It will be necessary to wait for official confirmation from General Eisenhower before the full scale and scope of this attack can be grasped, but any idea that it is species of revenge for the defeat at Arnhem may be dismissed, Sound strategy aims at victory, not vengeance. Page Three: Among the treasured souvenirs of the Glasgow Highlanders‘ stay in Belgium during the present campaign, will be a beautifully executed tapestry portrait of King George VI, which was presented to the battalion by the Mayor of the village of Bellingham. It had been kept hidden during the whole period of German occupation, and its presentation to the Scottish troops was a spontaneous gesture which was greatly appreciated. Page Four: Radio times for Saturday and Sunday. At 8.30pm on Sunday, listeners could hear the final episode of Dr Jekyll and Mr Hyde. It was also reported that during 1943-44, 1,124,255 people had visited the Art Gallery and its branch museums in Glasgow. This entry was posted in Food, History, Wartime, Wartime Rationing and tagged bread and butter pudding, Bread pudding, Glasgow, Great Western Road, hash browns, October 7th 1944, On this day in history, potato pastry, rationing, Second World War, St Mary's Cathedral Glasgow, The Glasgow Herald, The Home Front, Wartime cookery, wartime rations, World War Two. Bookmark the permalink.